NintenGen: Can the Wii reverse this trend? Can the Wii reverse this trend? The Wii has all the makings of a hit, but the Gamecube "hit" a new low for Nintendo in terms of console sales. The buzz on the Wii however, is much stronger and more wild even than Gamecube ever has been in its 5 year existence. I'll go on a limb and say that the Wii will even surpass the N64 total sales. The long answer...the Wii will bring back a lot of the NESers that have either changed alliances to PS or XB, or have given up on video games all together. 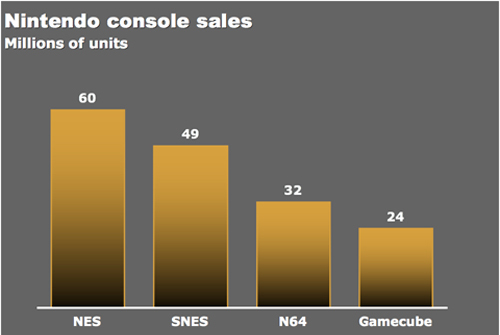 sidenote(an even longer answer)...this isn't a graph showing a steady decline in Nintendo's ability to innovate. Over the timespan this graph covers nintendo has modified it controller to include things like shoulder buttons, analog control, vibration feedback, not to mention the changes in their games graphical art style. These are all components that have caught on in the video game industry because they worked, and worked well. While these changes were welcomed by most of the die hard gamers, some felt turned off by the increasingly complex control style they were expected to master, as well as the high price tags they were expected to pay. leading to the steady decline in gaming as a mass market form of entertainment. This graph is more of a representation of steady decline in gaming by the general public. Compare the sales across all video games systems outside nintendo and you will see a similar pattern. The Wii is Nintendo's next and most aggressive modification to how we all play our games. This one, however, caters to even those who prefer simplicity and low cost. This is why the Wii will be such a success. This is how we will play our games in the future. Have no fear the graph will rise again. That is exactly why I posted this graph, to see responses like yours. Very well thought out. Playstation and Xbox have all distracted people from the company that is actually an inventor to go along with a game developer. Nintendo invents things(like the Wii-mote) and breaks new ground. The others have all taken notes and are now copying and pasting the success of Nintendo and trying to make money off it(Microsoft is losing money still on the Xbox brand and Sony will lose at least $200 per PS3 sold). I see the Wii making Nintendo s lot of bank. One other thing is, nintendo was always the innovater of the bunch. This was largely due to the fact that they know how to work the market, and when to stop pushing and finish off a project. What I mean by this is that when Sony decided to add the BlueTooth technology into the mix, it made their console highly overpriced. Ok, I do admit to buying the original PS2 when it came out, even with its 500$ (CAN) price-tag... But that was DVD technology. The world was moving to that, and VHS was slowly becoming obsolete. The VHS's ancestor was long gone at that time though, and the new thing was DVDs. In my opinion, VHS still hasn't done its time, and DVD are far from going anywhere. I think the BlueTooth integration might have been premature and is going to put the Playstation franchise in the red (although not bankrupting Sony, thank god). All this to bring me back to my original point, Nintendo knows when to stop. Their Wiis, although relatively cheap compared to anything else on the market, will rake in a very decent amount of profit, giving them even more leeway to develop new technologies, which other companies will pathetically attempt to copy once it has been announced (See rumble pack, Wiimotes and 3D rendering). Oh, and I still hate the Xbox, because it's Microsoft. Sorry, bias opinion.